Of the nine natha gurus, it is the eighth guru which begins the Navnath Sampradaya, Revan-Nath. My correspondence with Mr. Mullarpattan reveals “ Revan-Nath, who as an infant was discovered on the sandbeds of the river Reva.” His established headquarters is on the heights of the Revagiri Mountain. Then came 2) Kad-Siddheshwar Maharaj, 3) Guru Lingam-Jangam Maharaj who was also known as Nimbargi Maharaj (1789/1875),4) Shri Bhausaheb Maharaj (-1914), 5) Siddharameshwar Maharaj (1875-1936), 6)Sri Nisargadatta Maharaj (1897-1981) Mr. Mullarpattan tells me that the first two gurus were not householders, but renunciates. 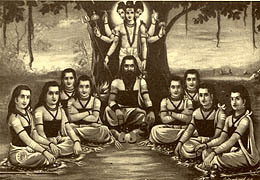 In the Sociology of Religion -The Navnath Sampradaya, there is an account of Revan-nath meeting Dattatreya and Matchindranath, “ One day while engaged in agricultural work he had the vision of Sri Dattatreya and by his grace he attained mahimasiddi (occult power) on the basis of which he had performed several miracles. Therefore he became famous as ‘Revanasiddha’ in that region. After sometime Matchindaranath paid a visit to that region. Owing to the occult power tiger, lion and other such wild animals forgetting their enmities were found to be with Matchinderanath. On seeing this, Revananath was flabbergasted. Revananath realized that his mahimasiddhi was of no help. This could be accomplished by Brahamjnana (realization of God). According to his wish Matchindaranath took Revananath to Sri Dattatraya. Sri Dattatraya initiated Revananath into spiritual life and Revananath spent sometime in penance under the guidance of Sri Dattaraya”( P.50). Although the sequence of events and the flow of time is obviously not that clear, there is a definite spiritual connection with Dattatreya and the Navnath lineage Although it does not make sence to me chronologically, I do know that after Revananath there was Kad-Siddeshwar Maharaj. He was also known as Muppina Muni. K.B. Dabade , in his Sociology of religion: a Case Study of Nimbargi Sampradaya, writes, “The Saint of Nimbargi was born in 1790 in Solapur (Maharashtra) but spent his life in Devar Nimbargi, a village in Bijapur distric (Karnataka). He belonged to a Nellawai sub-caste of Lingayat caste. His surname was Misalkar and Narayana or Nagappa was his horoscopic name. His disciples used to address him as Narayan Rao or Bhasaheb. He was also known as Juangam Mahara which was in fact the name of his Guru 9the spiritual preceptor). But he used this as his ensign, in the songs composed by him” (p.49) . Virasaiva or Lingayat affiliations were and are prevalent in Karnataka and Western India. In the introduction of Sociology of Religion of the Navnath Sampradaya we find an explanation of the Veerasaivist movement, “ Veerasaivism [Virasaivism] is a twelfth century reformist movement in Karnataka led by Basava - a charismatic leader and his followers. The core of Veerasaiva teachings is its refusal to recognize the principal of ritual pollution and purity, basic to Brahminical Hinduism. The biological processes such as birth, death, menstruation, spittle and jati (caste) cause ritual pollution necessitating segregation of persons for a fixed period before purification is effected. Veerasaivism proclaims non-observance of five kinds of pollution. Veerasaivism does not recognize ritual pollution and in practice it is considerably diluted. Veerasaivism refuses to make a distinction between auspicious and inauspicious occasions on the ground that the Linga emblem of Siva knows no pollution “ (Introduction,? : P41 ).